The English word "Germany" derives from Latin name Germania. The name "Germania" came into use after Julius Caesar adopted it from a Gallic term for the peoples east of the Rhine that probably meant "neighbor". Germany, officially the Federal Republic of Germany is a country in Central Europe. It is bordered to the north by the North Sea, Denmark, and the Baltic Sea; to the east by Poland and the Czech Republic; to the south by Austria and Switzerland; and to the west by France, Luxembourg, Belgium, and the Netherlands. The territory of Germany covers 357,021 square kilometers (137,847 sq mi) and is influenced by a temperate seasonal climate. With 82 million inhabitants, it accounts for the largest population among the member states of the European Union and is home to the third-largest number of international migrants worldwide. A region named Germania inhabited by several Germanic peoples has been known and documented before AD 100. Beginning in the 10th century, German territories formed a central part of the Holy Roman Empire that lasted until 1806. During the 16th century, northern Germany became the centre of the Protestant Reformation. As a modern nation-state, the country was first unified amidst the Franco-Prussian War in 1871. 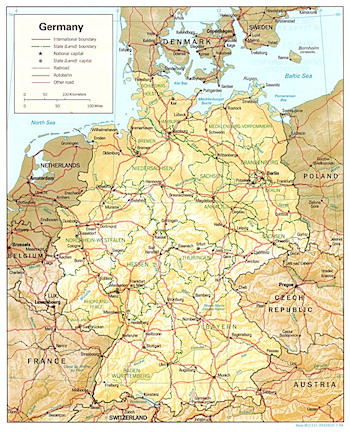 In 1949, after World War II, Germany was divided into two separate statesEast Germany and West Germanyalong the lines of Allied occupation. The two states were unified in 1990. West Germany was a founding member of the European Community (EC) in 1957, which became the European Union in 1993. It is part of the Schengen zone and adopted the European currency, the euro, in 1999. Germany is a federal parliamentary republic of sixteen states. The capital and largest city is Berlin. Germany is a member of the United Nations, NATO, G8 and the OECD. It is a major economic power with the world's fourth largest economy by nominal GDP and the fifth largest in purchasing power parity. It is the largest exporter and second largest importer of goods. In absolute terms, Germany allocates the second biggest annual budget of development aid in the world, while its military expenditure ranked sixth. The country has developed a high standard of living and established a comprehensive system of social security. It holds a key position in European affairs and maintains a multitude of close partnerships on a global level. Germany is recognised as a scientific and technological leader in several fields. The ethnogenesis of the Germanic tribes is assumed to have occurred during the Nordic Bronze Age, or at the latest, during the Pre-Roman Iron Age. From southern Scandinavia and northern Germany, the tribes began expanding south, east and west in the 1st century BC, coming into contact with the Celtic tribes of Gaul as well as Iranian, Baltic, and Slavic tribes in Eastern Europe. Little is known about early Germanic history, except through their recorded interactions with the Roman Empire, etymological research and archaeological finds. Under Augustus, the Roman General Publius Quinctilius Varus began to invade Germania (a term used by the Romans to define a territory running roughly from the Rhine to the Ural Mountains), and it was in this period that the Germanic tribes became familiar with Roman tactics of warfare while maintaining their tribal identity. In AD 9, three Roman legions led by Varus were defeated by the Cheruscan leader Arminius in the Battle of the Teutoburg Forest. Modern Germany, as far as the Rhine and the Danube, thus remained outside the Roman Empire. By AD 100, the time of Tacitus' Germania, Germanic tribes settled along the Rhine and the Danube (the Limes Germanicus) , occupying most of the area of modern Germany. The 3rd century saw the emergence of a number of large West Germanic tribes: Alamanni, Franks, Chatti, Saxons, Frisians, Sicambri, and Thuringii. Around 260, the Germanic peoples broke through the Limes and the Danube frontier into Roman-controlled lands. On 25 December 800, Charlemagne founded the Carolingian Empire, which was divided in 843. The medieval empire resulted from the eastern portion of this division and existed in varying forms from 962 until 1806. Its territory stretched from the Eider River in the north to the Mediterranean coast in the south. Often referred to as the Holy Roman Empire (or the Old Empire), it was officially called the Sacrum Romanum Imperium Nationis Germanicæ (Holy Roman Empire of the German Nation) starting in 1448, to adjust the title to its then reduced territory. Under the reign of the Ottonian emperors (9191024), the duchies of Lorraine, Saxony, Franconia, Swabia, Thuringia, and Bavaria were consolidated, and the German king was crowned Holy Roman Emperor of these regions in 962. Under the reign of the Salian emperors (10241125), the Holy Roman Empire absorbed northern Italy and Burgundy, although the emperors lost power through the Investiture Controversy. Under the Hohenstaufen emperors (11381254), the German princes increased their influence further south and east into territories inhabited by Slavs, preceding German settlement in these areas and further east (Ostsiedlung). Northern German towns grew prosperous as members of the Hanseatic League. Starting with the Great Famine in 1315, then the Black Death of 1348-50, the population of Germany plummeted. The edict of the Golden Bull in 1356 provided the basic constitution of the empire that lasted until its dissolution. It codified the election of the emperor by seven prince-electors who ruled some of the most powerful principalities and archbishoprics. Beginning in the 15th century, the emperors were elected nearly exclusively from the Habsburg dynasty of Austria. The monk Martin Luther publicised his 95 Theses in 1517, challenging practices of the Roman Catholic Church, initiating the Protestant Reformation. A separate Lutheran church became the official religion in many German states after 1530. Religious conflict led to the Thirty Years' War (16181648) , which devastated German lands. The population of the German states was reduced by about 30%. The Peace of Westphalia (1648) ended religious warfare among the German states, but the empire was de facto divided into numerous independent principalities. From 1740 onwards, the dualism between the Austrian Habsburg Monarchy and the Kingdom of Prussia dominated German history. In 1806, the Imperium was overrun and dissolved as a result of the Napoleonic Wars. Following the fall of Napoleon Bonaparte, the Congress of Vienna convened in 1814 and founded the German Confederation (Deutscher Bund), a loose league of 39 sovereign states. Disagreement with restoration politics partly led to the rise of liberal movements, demanding unity and freedom. These, however, were followed by new measures of repression on the part of the Austrian statesman Metternich. The Zollverein, a tariff union, profoundly furthered economic unity in the German states. During this era many Germans had been stirred by the ideals of the French Revolution, and nationalism became a more significant force, especially among young intellectuals. For the first time, the colours of black, red and gold were chosen to represent the movement, which later became the national colours. In light of a series of revolutionary movements in Europe, which successfully established a republic in France, intellectuals and commoners started the Revolutions of 1848 in the German states. The monarchs initially yielded to the revolutionaries' liberal demands. King Frederick William IV of Prussia was offered the title of Emperor, but with a loss of power; he rejected the crown and the proposed constitution, leading to a temporary setback for the movement. Conflict between King William I of Prussia and the increasingly liberal parliament erupted over military reforms in 1862, and the king appointed Otto von Bismarck the new Prime Minister of Prussia. Bismarck successfully waged war on Denmark in 1864. Prussian victory in the Austro-Prussian War of 1866 enabled him to create the North German Federation (Norddeutscher Bund) and to exclude Austria, formerly the leading German state, from the affairs of the remaining German states. The state known as Germany was unified as a modern nation-state in 1871, when the German Empire was forged, with the Kingdom of Prussia as its largest constituent. After the French defeat in the Franco-Prussian War, the German Empire was proclaimed in Versailles on 18 January 1871. The Hohenzollern dynasty of Prussia ruled the new empire, whose capital was Berlin. The empire was a unification of all the scattered parts of Germany except Austria (Kleindeutschland, or "Lesser Germany"). Beginning in 1884, Germany began establishing several colonies outside of Europe. In the Gründerzeit period following the unification of Germany, Emperor William I's foreign policy secured Germany's position as a great nation by forging alliances, isolating France by diplomatic means, and avoiding war. Under William II, however, Germany, like other European powers, took an imperialistic course leading to friction with neighbouring countries. Most alliances in which Germany had been previously involved were not renewed, and new alliances excluded the country. Specifically, France established new relationships by signing the Entente Cordiale with the United Kingdom and securing ties with the Russian Empire. Aside from its contacts with Austria-Hungary, Germany became increasingly isolated. Germany's imperialism reached outside of its own country and joined many other powers in Europe in claiming their share of Africa. The Berlin Conference divided Africa between the European powers. Germany owned several pieces of land in Africa including German East Africa, South-West Africa, Togo, and Cameroon. The Scramble for Africa caused tension between the great powers that may have contributed to the conditions that led to World War I. The assassination of Austria's crown prince on 28 June 1914 triggered World War I. Germany, as part of the unsuccessful Central Powers, suffered defeat against the Allied Powers in one of the bloodiest conflicts of all time. An estimated two million German soldiers died in World War I. The German Revolution broke out in November 1918, and Emperor William II and all German ruling princes abdicated. An armistice putting an end to the war was signed on 11 November and Germany was forced to sign the Treaty of Versailles in June 1919. Its negotiation, contrary to traditional post-war diplomacy, excluded the defeated Central Powers. The treaty was perceived in Germany as a humiliating continuation of the war by other means and its harshness is often cited as having facilitated the later rise of Nazism in the country. At the beginning of the German Revolution, Germany was declared a republic and the monarchy collapsed. However, the struggle for power continued, with radical-left communists seizing power in Bavaria, but failing to take control of all of Germany. The revolution came to an end in August 1919, when the Weimar Republic was formally established. The Weimar Constitution came into effect with its signing by President Friedrich Ebert on 11 August 1919. Suffering from the Great Depression, the harsh peace conditions dictated by the Treaty of Versailles, and a long succession of more or less unstable governments, the people of Germany increasingly lacked identification with their political system and the "Establishment Parties" in their parliamentary democracy. This was exacerbated by a widespread right-wing (monarchist, völkisch, and Nazi) Dolchstoßlegende, which promoted the view that Germany had lost World War I because of the efforts and influence of those who wanted to overthrow the government. The top brass of the Weimar government was accused of betraying the German Nation by signing the Versailles Treaty, while the radical left-wing communists, such as the Spartacist League, had wanted a revolution to abolish "capitalist rule" in favour of a Räterepublik, and were also targeted. Nevertheless, discontentment with the new Weimar government helped fuel the growth of the German Communist Party. Many conservatives were drawn towards the reactionary/revolutionary right, particularly the National Socialist German Workers Partythe Nazi Party. By 1932, these two parties controlled the majority of parliament (296 total parliamentary seats by July 1932). After a series of unsuccessful cabinets, President Paul von Hindenburg made a crucial decision: on 30 January 1933, seeing little alternative and pushed by right-wing advisors, von Hindenburg appointed Adolf Hitler as Chancellor of Germany, honoring Hitler's request. On 27 February 1933, the Reichstag went up in flames. Afterwards an emergency decree was made and some basic democratic rights were quickly abrogated. An Enabling Act gave the Hitler-led government full legislative power. Only the Social Democratic Party of Germany voted against the measure, while the Communists, who were thought to be behind the fire, were not able to present opposition due to the Reichstag Fire Decree. A centralised totalitarian state was established by a series of moves and decrees making Germany a single-party state. Industry was revitalised, with a focus on military rearmament. In 1936, Germany reacquired control of the Rhineland, the first of several expansionist moves to establish Greater Germany. In 1939, growing tensions from nationalism, militarism, and territorial issues and a pact promising support from the Soviet Union led the Germans to launch a blitzkrieg ("lightning war") against Poland, which was followed by declarations of war from Britain and France. This marked the beginning of World War II in Europe. As the war continued, Germany and its allies quickly gained direct or indirect control of the majority of Europe. On 22 June 1941, Germany broke the pact with the Soviets and invaded the Soviet Union. The same year, Japan attacked the American base at Pearl Harbor, and Germany declared war on the United States. Although the German army advanced into the Soviet Union quite rapidly, the Battle of Stalingrad marked a major turning point in the war. Subsequently, the German army started to retreat on the Eastern front. D-Day marked another major turning point in the war, opening up a Western front; the Allied forces landed on the beaches of Normandy and made advances towards German territory. Germany's defeat soon followed. On 8 May 1945, the German armed forces surrendered after the Red Army occupied Berlin. Approximately seven million German soldiers and civilians including ethnic Germans from Eastern Europedied during World War II. In what later became known as The Holocaust, the Third Reich regime enacted governmental policies directly subjugating many dissidents and minorities. About eleven million people were murdered during the Holocaust, including six million Jews and sizable number of Gypsies, Poles and other Slavs, the mentally ill and homosexuals. World War II and the actions of the German Nazi regime resulted in 35 million premature deaths in Europe. The war resulted in the death of nearly ten million German soldiers and civilians; large territorial losses; the expulsion of about 15 million Germans from the former eastern territories and other countries; and the destruction of multiple major cities. The remaining national territory and Berlin were partitioned by the Allies into four military occupation zones. The western sectors, controlled by France, the United Kingdom, and the United States, were merged on 23 May 1949, to form the Federal Republic of Germany (Bundesrepublik Deutschland, or BRD); on 7 October 1949, the Soviet Zone became the German Democratic Republic (Deutsche Demokratische Republik, or DDR). They were informally known as "West Germany" and "East Germany", and the two parts of Berlin as "West Berlin" and "East Berlin". East Germany selected East Berlin as its capital, while West Germany chose Bonn. However, West Germany declared the status of its capital Bonn as provisional, in order to emphasise its stance that the two-state solution was an artificial status quo that was to be overcome one day. West Germany, established as a federal parliamentary republic with a "social market economy", was allied with the United States, the UK and France. The country came to enjoy prolonged economic growth beginning in the early 1950s (Wirtschaftswunder). West Germany joined NATO in 1955 and was a founding member of the European Economic Community in 1957. The Berlin Wall in front of the Brandenburg Gate shortly after the opening in 1989.East Germany was an Eastern bloc state under political and military control by the USSR via the latter's occupation forces and the Warsaw Treaty. While claiming to be a democracy, political power was solely executed by leading members (Politburo) of the communist-controlled SED (Socialist Unity Party of Germany). Their power was ensured by the Stasi, a secret service of immense size, and a variety of SED suborganizations controlling every aspect of society. In return, the basic needs of the population were satisfied at low cost by the state. A Soviet-style command economy was set up; later, the GDR became a Comecon state. While East German propaganda was based on the benefits of the GDR's social programs and the alleged constant threat of a West German invasion, many of her citizens looked to the West for political freedoms and economic prosperity. The Berlin Wall, built in 1961 to stop East Germans from escaping to West Germany, became a symbol of the Cold War. Tensions between East and West Germany were somewhat reduced in the early 1970s by Chancellor Willy Brandt's Ostpolitik, which included the de facto acceptance of Germany's territorial losses in World War II. In the summer of 1989, Hungary decided (May 2) to dismantle the Iron Curtain and open the borders (August 23), causing an exodus of thousands of East Germans (September 11) going to West Germany via Hungary. The effects of the Hungarian events had devastating effects on the GDR, with mass demonstrations. The East German authorities unexpectedly eased the border restrictions in November, allowing East German citizens to travel to the West. Originally intended as a pressure valve to retain East Germany as a state, the opening of the border actually led to an acceleration of the Wende reform process in East Germany, which finally concluded with the Two Plus Four Treaty a year later on 12 September 1990, under which the four occupying powers renounced their rights under the Instrument of Surrender, and Germany regained full sovereignty. This permitted German reunification on 3 October 1990, with the accession of the five re-established East German states (New Länder or "new federal states"). The territory of Germany covers 357,021 km2 (137,847 sq mi), consisting of 349,223 km2 (134,836 sq mi) of land and 7,798 km2 (3,011 sq mi) of water. It is the seventh largest country by area in Europe and the 63rd largest in the world. Elevation ranges from the mountains of the Alps (highest point: the Zugspitze at 2,962 metres (9,718 ft)) in the south to the shores of the North Sea (Nordsee) in the north-west and the Baltic Sea (Ostsee) in the north-east. Between lie the forested uplands of central Germany and the low-lying lands of northern Germany (lowest point: Wilstermarsch at 3.54 metres (11.6 ft) below sea level), traversed by some of Europe's major rivers such as the Rhine, Danube and Elbe. Germany shares borders with more European countries than any other country on the continent. Its neighbours are Denmark in the north, Poland and the Czech Republic in the east, Austria and Switzerland in the south, France and Luxembourg in the south-west and Belgium and the Netherlands in the north-west. Most of Germany has a temperate seasonal climate in which humid westerly winds predominate. The climate is moderated by the North Atlantic Drift, which is the northern extension of the Gulf Stream. This warmer water affects the areas bordering the North Sea including the peninsula of Jutland and the area along the Rhine, which flows into the North Sea. Consequently in the north-west and the north, the climate is oceanic; rainfall occurs year round with a maximum during summer. Winters are mild and summers tend to be cool, though temperatures can exceed 30 °C (86 °F) for prolonged periods. In the east, the climate is more continental; winters can be very cold, summers can be very warm, and long dry periods are often recorded. Central and southern Germany are transition regions which vary from moderately oceanic to continental. Again, the maximum temperature can exceed 30 °C (86 °F) in summer. Phytogeographically, Germany is shared between the Atlantic European and Central European provinces of the Circumboreal Region within the Boreal Kingdom. The territory of Germany can be subdivided into four ecoregions: the Atlantic mixed forests, Baltic mixed forests, Central European mixed forests and Western European broadleaf forests. The majority of Germany is covered by either arable land (33%) or forestry and woodland (31%). Only 15% is covered by permanent pastures. Around one third of the country´s area is covered with forests. (Thuringian Forest)Plants and animals are those generally common to middle Europe. Beeches, oaks, and other deciduous trees constitute one-third of the forests; conifers are increasing as a result of reforestation. Spruce and fir trees predominate in the upper mountains, while pine and larch are found in sandy soil. There are many species of ferns, flowers, fungi, and mosses. Fish abound in the rivers and the North Sea. Wild animals include deer, wild boar, mouflon, fox, badger, hare, and small numbers of beaver. Various migratory birds cross Germany in the spring and autumn. The national parks in Germany include the Wadden Sea National Parks, the Jasmund National Park, the Vorpommern Lagoon Area National Park, the Müritz National Park, the Lower Oder Valley National Park, the Harz National Park, the Saxon Switzerland National Park and the Bavarian Forest National Park. Germany is known for its many zoological gardens, wildlife parks, aquaria, and bird parks. More than 400 registered zoos and animal parks operate in Germany, which is believed to be the largest number in any single country of the world. The Zoologischer Garten Berlin is the oldest zoo in Germany and presents the most comprehensive collection of species in the world. German is the official and predominantly spoken language in Germany. It is one of 23 official languages in the European Union, and one of the three working languages of the European Commission, along with English and French. Recognised native minority languages in Germany are Danish, Sorbian, Romany, and Frisian. They are officially protected by the ECRML. Most used immigrant languages are Turkish, Polish, the Balkan languages, and Russian. The standard German is a West Germanic language and is closely related to and classified alongside English, Dutch, and the Frisian languages. To a lesser extent, it is also related to the East (extinct) and North Germanic languages. Most German vocabulary is derived from the Germanic branch of the Indo-European language family. Significant minorities of words are derived from Latin and Greek, with a smaller amount from French and most recently English (known as Denglisch). German is written using the Latin alphabet. In addition to the 26 standard letters, German has three vowels with Umlauts, namely ä, ö, and ü, as well as the Eszett or scharfes S (sharp s) which is written "ß". German dialects are distinguished from varieties of standard German. The German dialects are the traditional local varieties and are traced back to the different German tribes. Many of them are not easily understandable to someone who knows only standard German, since they often differ from standard German in lexicon, phonology, and syntax. Around the world, German is spoken by approximately 100 million native speakers and also about 80 million non-native speakers. German is the main language of about 90 million people (18%) in the EU. 67% of the German citizens claim to be able to communicate in at least one foreign language, 27% in at least two languages other than their own. Germany is historically called Das Land der Dichter und Denker (the land of poets and thinkers). German culture began long before the rise of Germany as a nation-state and spanned the entire German-speaking world. From its roots, culture in Germany has been shaped by major intellectual and popular currents in Europe, both religious and secular. As a result, it is difficult to identify a specific German tradition separated from the larger framework of European high culture. Another consequence of these circumstances is the fact that some historical figures, such as Wolfgang Amadeus Mozart, Franz Kafka and Paul Celan, though not citizens of Germany in the modern sense, must be considered in the context of the German cultural sphere in order to understand their historical situation, work and social relations. Blaues Pferd I, 1911 by Franz Marc (18801916).In Germany, the Federal States are in charge of the cultural institutions. There are 240 subsidised theatres, hundreds of symphonic orchestras, thousands of museums and over 25,000 libraries spread over the 16 states. These cultural opportunities are enjoyed by many millions: there are over 91 million German museum visits every year; annually, 20 million go to theatres and operas; while 3.6 million listen to the great symphonic orchestras. Germany claims some of the world's most renowned classical music composers, including Ludwig van Beethoven, Johann Sebastian Bach, Johannes Brahms and Richard Wagner. As of 2006, Germany is the fifth largest music market in the world and has influenced pop and rock music through artists such as Kraftwerk, Scorpions and Rammstein. Numerous German painters have enjoyed international prestige through their work in diverse artistic styles. Hans Holbein the Younger, Matthias Grünewald, and Albrecht Dürer were important artists of the Renaissance, Caspar David Friedrich of Romanticism, and Max Ernst of Surrealism. Architectural contributions from Germany include the Carolingian and Ottonian styles, which were important precursors of Romanesque. The region later became the site of significant works in styles such as Gothic, Renaissance and Baroque. Germany was particularly important in the early modern movement, especially through the Bauhaus movement founded by Walter Gropius. Ludwig Mies van der Rohe, also from Germany, became one of world's most renowned architects in the second half of the 20th century. The glass façade skyscraper was his idea. Germany's influence on philosophy is historically significant and many notable German philosophers have helped shape western philosophy since the Middle Ages. Gottfried Leibniz's contributions to rationalism; the establishment of classical German idealism by Immanuel Kant, Georg Wilhelm Friedrich Hegel, Friedrich Wilhelm Joseph Schelling and Johann Gottlieb Fichte; Karl Marx's and Friedrich Engels' formulation of Communist theory; Arthur Schopenhauer's composition of metaphysical pessimism; Friedrich Nietzsche's development of Perspectivism; Martin Heidegger's works on Being; and the social theories of Jürgen Habermas were especially influential. German literature can be traced back to the Middle Ages and the works of writers such as Walther von der Vogelweide and Wolfram von Eschenbach. Various German authors and poets have won great renown, including Johann Wolfgang von Goethe and Friedrich Schiller. The collections of folk tales published by the Brothers Grimm popularised German folklore on an international level. Influential authors of the 20th century include Thomas Mann, Berthold Brecht, Hermann Hesse, Heinrich Böll, and Günter Grass. German cuisine varies from region to region. The southern regions of Bavaria and Swabia, for instance, share a culinary culture with Switzerland and Austria. Pork, beef, and poultry are the main varieties of meat consumed in Germany, with pork being the most popular. Throughout all regions, meat is often eaten in sausage form. More than 1500 different types of sausage are produced in Germany. The most popular vegetables are potatoes, cabbage, carrots, turnips, spinach, and beans. Organic food has gained a market share of around 3.0%, and is predicted to increase further. A popular German saying has the meaning: "Breakfast like an emperor, lunch like a king, and dine like a beggar." Breakfast is usually a selection of breads and rolls with jam and honey or cold meats and cheese, sometimes accompanied by a boiled egg. Cereals or muesli with milk or joghurt is less common but widespread. More than 300 types of bread are sold in bakery shops across the country. As a country with many immigrants, Germany has adopted many international dishes into its cuisine and daily eating habits. Italian dishes like Pizza and Pasta, Turkish and Arab dishes like Döner Kebab and Falafel are well established, especially in bigger cities. International burger chains, as well as Chinese and Greek restaurants, are widespread. Indian, Thai, Japanese, and other Asian cuisines have gained popularity in recent decades. Among nine high-profile restaurants in Germany, the Michelin guide has awarded three stars, the highest designation, while 15 more received two stars. German restaurants have become the world's second most decorated after eateries in France. Although wine is becoming more popular in many parts of Germany, the national alcoholic drink is beer. German beer consumption per person is declining butat 116 litres annuallyit is still among the highest in the world. Beer varieties include Alt, Bock, Dunkel, Kölsch, Lager, Malzbier, Pils, and Weizenbier. Among 18 surveyed western countries, Germany ranked 14th in the list of per capita consumption of soft drinks in general, while it ranked third in the consumption of fruit juices. Furthermore, carbonated mineral water and Schorle (its mixture with fruit juice) are very popular in Germany.